So, just how would you document the social and economic benefits provided by GPS? GPS is used practically everywhere today. GPS produces direct and indirect economic and social benefits, tangible and intangible. Expand that thought to include all the geospatial applications in use today such as national security and safety of life. Then include precision agriculture and water resource management and the use of mapping to improve decision making in emergency management, managing endangered species, conducting property tax assessments and verifying insurance claims. Add in many more, including the geo-referencing of earth observation and remote sensing data. Geospatial data is BIG data. Studies undertaken in the past decade have focused on the direct economic benefits resulting from the manufacture and sale of GPS enabled equipment or other data derived from product manufacture and sale. Only incidental credit has been given to the value of services that use location referenced data. Panel providing perspectives on Day 1. 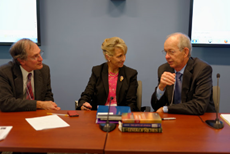 Jay Pearlman, J&F Enterprise, and University of Colorado; Molly Macauley, RFF; Jim Geringer, Esri. But let’s look beyond GPS and discuss open geospatial information. 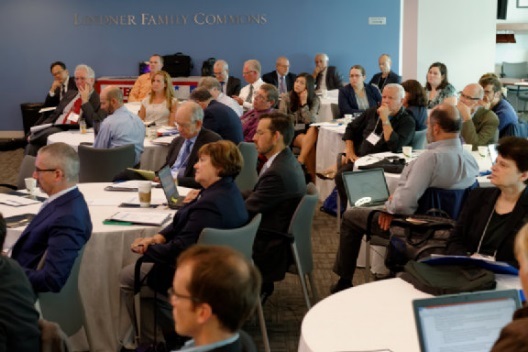 The recent Workshop “Assessing the Socio-economic Impacts and Value of ‘Open’ Geospatial Information,” October 28 and 29 2014, at George Washington University in Washington DC, drew a wide cross section of participants to discuss socioeconomic value of ever increasing open geospatial information. A number of sources of open data were cited, including the U.S. Federal Open Data Initiative, that are made available at zero or marginal cost, with unrestrictive licensing, and machine readable in standardized data formats. Other countries have similar initiatives. The Workshop featured two position papers prepared especially for the conference, a series of keynote speeches and several panel discussions. The result was strong participant engagement that pointed to the need to better inform social and natural scientists, researchers, policy makers and analysts, financial analysts, economists, geospatial practitioners, and other experts from government, academia, and the private sector. So, how would you determine the value of open geospatial information? Not an easy task. GPS information is only a part of the greater geospatial information picture. Remote sensing, the Internet of Things, geo-referencing of almost anything on your smartphone device—these are just the beginning of ever increasing geospatial information. Then, the enabling of open access to existing and new data leads to more use and creates greater value, particularly compared to access that is granted only by payment of a fee or by meeting restricted access protocols. Access and use have accelerated exponentially through digital access and online delivery. Economists assess the value of open geospatial data in several ways, such as Investment and Use Value, Contingent Value, Efficiency Impact, Productivity gains, Return on Investment in Data and then Wider Impacts, including societal and safety effects, as described by John Houghton. Private gain and public benefit are analyzed. 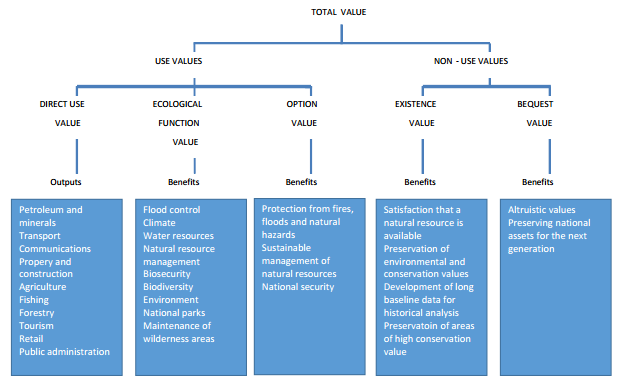 Another approach, illustrated below, as presented by Alan Smart at the Workshop, calls attention to the non-direct use values that are highly valued in non-monetary ways. Geospatial data are an increasing influence on decisions. Policy decisions, as well as investment and business decisions, may be either/or, that is, for or against a particular approach, or they may be comparative, considering the benefits/impacts of two or more options. Geospatial data is a beginning or intermediate step, with many and multiple possible uses and combinations of data feeding into even more applications and actions, both planned and serendipitous. The value chain starts with data that leads to information followed by analysis, development of scenarios or options and ultimately, actions and decisions. But then results are assessed and decisions updated. The value chain is enhanced by comparing trends and changes in data over time, not just at a point in time. Data is both dynamic and static. With increasing globalization, the value chain impact is seldom felt just locally. The economics change with each update. In the end however, data alone are of little value. Value comes through the application of data. Tools are essential to distill big data into something useful. Geographic information systems (GIS) are increasingly used as a platform to enable the value chain that results in better decisions. The Workshop was just one of a series that will continue to assess the socioeconomic value of open geospatial data. Stay tuned. Or better yet, contribute your thoughts on how to calculate value.